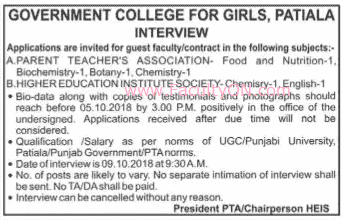 Govt College for Girls, Patiala has advertised in the ***** newspaper for the recruitment of Teaching Faculty- Guest Faculty jobs vacancies. Interested and eligible job aspirants are requested to apply on or before 05th October 2018. Check out further more details below. About College: Govt. College for Girls , Pataiala, a premier Institution for Girls education in the region was established in 1942, as Victoria Girls College with twenty students . Great Education and Philosopher Saravpali Dr. Radhia Krishnan ji laid the foundation stone of present Institution on 23rd jan 1954, which is sprawling over approx 25 acre campus. Ever since its inception this college has risen from strength to strength and has made its mark in a range of fileds in acdemics, cultural activities and sports . As per UGC / Punjab Govt. / Punjabi University / PTA norms. Reference: Advertisement on ***** newspaper dated 27th September 2018. Newspaper name is hidden here. If you want to know the name of the newspaper, you may contact us and we will send you the name.